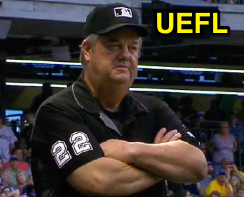 With UEFL awards season now complete, it is time to unveil the Umpire Ejection Fantasy League's Final Standings for 2017, as well as the Perfect Crew. This year's "Perfect Score" was 112 while the lowest score possible was -39, a spread of 151 points. 2017 Perfect Crew (Highest Scoring Crew): 112 points. Crew Chief: Joe West (23 pts). Primary Umpires: Will Little (26 pts) & Vic Carapazza (22 pts). Secondary Umpires: Mark Wegner (23 pts) & Chad Fairchild (18 pts). 2017 Imperfect Crew (Lowest Scoring Crew): -39 points. Crew Chief: Jerry Meals (-6 pts). Primary Umpires: Tony Randazzo (-6 pts) & Dan Bellino (-6 pts). Secondary Umpires: DJ Reyburn (-12 pts) & Lance Barrett (-9 pts). Joe West led 2017's "Perfect Crew." 7) toss 'em (62 pts). 8) Bryce Swanson (62 pts). 17) Denny Crane (56 pts). 26) Bleacher Bums (49 pts). 27) Commander Red (49 pts). Complete Final Standings, points, and results available via the UEFL Portal: 2017 Standings page.